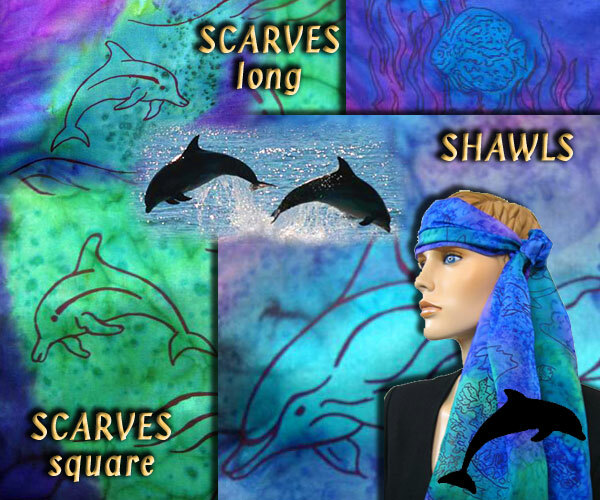 Dolphin designs on Silk Shawls and Scarves, hand painted wearable art. The Australian Coast, Reefs, and waters are host to many spectacular creatures. Dolphins being one of the most beautiful and awe-inspiring. Our Dolphin scarves and shawls feature dolphins swimming in pods, leaping in the surf and cruising among the corals of the Great Barrier Reef. Our hand-drawn designs are screen-printed onto lengths of fine, pure silk. The silk is then painted by hand in the vivid hues of the ocean, its reefs and shores.